just write: piece by piece. | The girl who loved to write about life. we're all a little scarred. I can love your shattered heart. keep hidden in the dark. for that's not what you need. 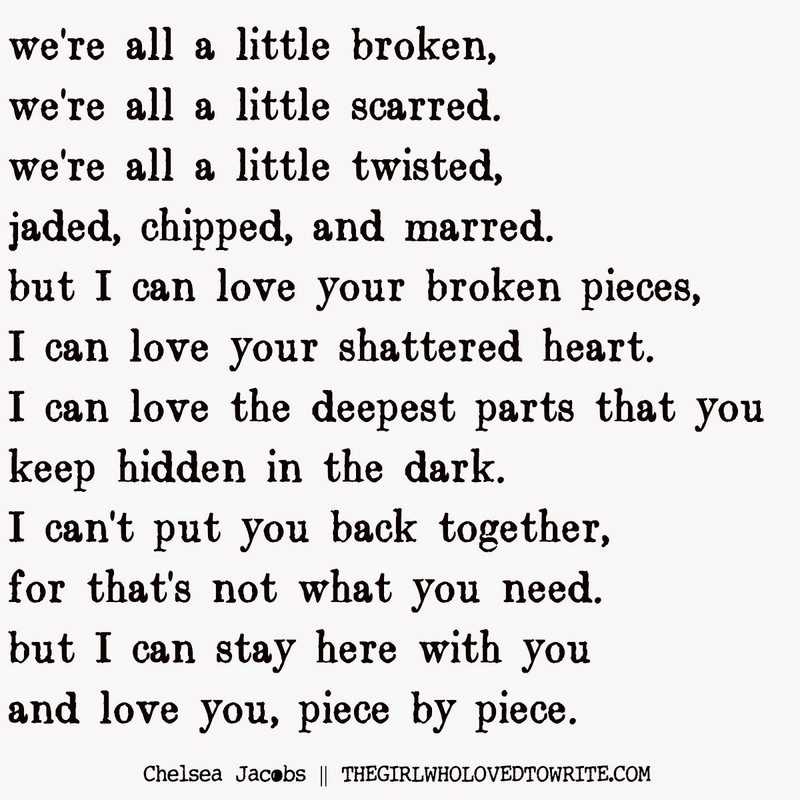 and love you, piece by piece. I love reading your poems every day. Such a breathe of fresh air! So beautiful. I love the opening lines!!! you could be a song writer in addition to a brilliant author. I can hear the melody. lovely! Love this so so much. This is my favorite one you've posted so far. This is my favorite, so perfect. Chels...this is seriously SO beautiful. Feeling so inspired by you! This!!! I absolutely love this! And it is so true, we are all a little broken. Beautiful! Beautiful poem! This feels so true to how we need to be loved! Thanks for sharing! It's a really inspiring piece. So beautiful. Thanks so much for sharing. Chelsea, this is so, so beautiful!! I just love it and I think it is something everyone can relate to in some way. Thank you for sharing your writing with the world! This could be a song. Love it! poignant. i like the last line "piece by piece," how it's such a thoughtful response to the opening line that we're all broken.